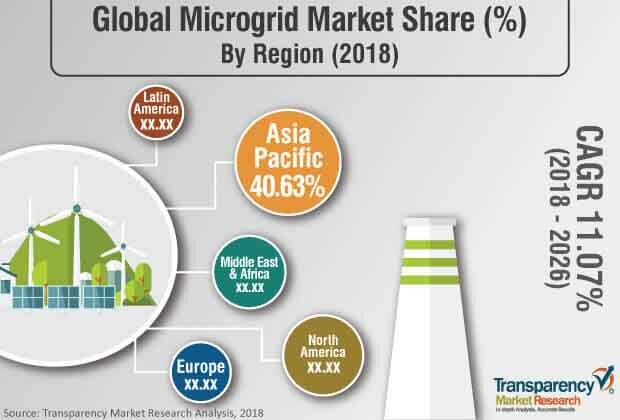 The global microgrid market was valued at US$ 46.92 Bn in 2017 and is anticipated to expand at a CAGR of over 11% from 2018 to 2026, according to a new report by Transparency Market Research (TMR) titled ‘Microgrid Market – Global Industry Analysis, Size, Share, Growth, Trends, and Forecast, 2017–2026.’ The term ‘microgrid’ refers to a collection of distributed energy sources and loads interconnected in a clear and well-defined electrical boundary, which functions as a single controllable entity. A microgrid can also be considered a smaller version of the conventional electric grid. A microgrid is either connected to a macrogrid or it operates in a standalone manner, which enables the microgrid to function as a backup power in case of grid failures and power outages. Microgrids utilize distributed energy sources such as diesel generators or renewables for power generation. Advancements in the field of renewable energy and increasing adoption of renewables as a clean source of energy are likely to drive the microgrid market during the forecast period. Moreover, rapid industrialization and urbanization across the globe is driving the demand for reliable and affordable power. The current macrogrids are unable to meet this demand. It can be easily met with the use of microgrids and distributed generation technologies. Thus, increasing industrialization is also likely to be a key driver of the microgrid market in the next few years. Another major driver is economic, technical, environmental, and social benefits from the use of microgrids. However, operational challenges faced by microgrids as well as their high development costs can restraint the market in the near future. Instability of macrogrids in harsh climatic conditions or in the event of a natural disaster presents immense opportunities for growth of the microgrid market. Unlike macrogrids, microgrids can be easily designed to operate in extreme conditions. They can act as substitutes for macrogrids at any point of time. The microgrid market can be segmented based on connectivity and application. In terms of connectivity, the microgrid market can be classified into grid-tied (grid-connected) and off-grid. Grid-tied (grid-connected) was the dominant segment, accounting for over 55% of the market share, in terms of value, in 2017. The off-grid segment is projected to be expand at a rapid pace during the forecast period, due to increasing demand for power from underdeveloped and developing countries. Based on application, the microgrid market can be classified into campus & institution, community & utility, commercial & industrial, defense & military, and remote island. The remote island segment dominated the global microgrid market, holding more than 38% of the market share in 2017. On the other hand, the community & utility segment is anticipated to expand at a significant pace in the near future, primarily due to rising investments in the grid infrastructure for grid stability by the means of distributed energy generation and microgrids. Utility companies are focusing on providing uninterrupted power to their customers, for which they are shifting toward microgrids for providing power backup. Communities are investing in microgrids to avoid any blackouts and grid failures in future. In terms of region, the global microgrid market can be classified into North America, Latin America, Europe, Asia Pacific, and Middle East & Africa. Asia Pacific held a leading i.e. more than 40% share of the global microgrid market in 2017. This can be attributed to China, India, and countries of ASEAN; wherein microgrids have become an essential part of the country’s power output and microgrids are helping them meet the power demand in rural and off-grid areas. Moreover, the microgrid market in Asia Pacific is expected to expand at a significant pace during the forecast period, primarily due to increasing demand for power led by ongoing industrialization and rising standards of living in the region, especially in China and India, where industrialization and urbanization is rising at a high pace. Key players covered in this report are Siemens AG, General Electric, S&C Electric Company, ABB Group, Schneider Electric SE, Engie Group, Honeywell International Inc., Echelon Corporation, Pareto Energy Limited, Toshiba Corporation, Duke Energy Corporation, and Power Analytics Corporation. A large number of suppliers and less number of buyers of microgrids exist in the market.